Please send me e-mail with additional info, links, photos, corrections, etc.- my memory is fuzzy! JUST GETTING STARTED - THIS IS A WORK IN PROGRESS! Some computer graphics posters from the 1980s. So far I have concentrated on U.S. development simply because I am most familiar with it. Please send links or info on early development work and products elsewhere. My rough criterion for "Early" is that the device was external to a computer - no workstation or PC plug-in boards. Roughly restricted to pre-1985 or so. I've also stuck to systems that a user could program from a host computer. I have omitted display systems that were "closed", e.g. ..... unless this somehow led into other systems (e.g. Ampex AVA developers led to Pixar Image Computer). Hey, it is my page so I get to make arbitrary decisions.....but I'm easily persuaded. Early computer graphics research labs - I need more info! 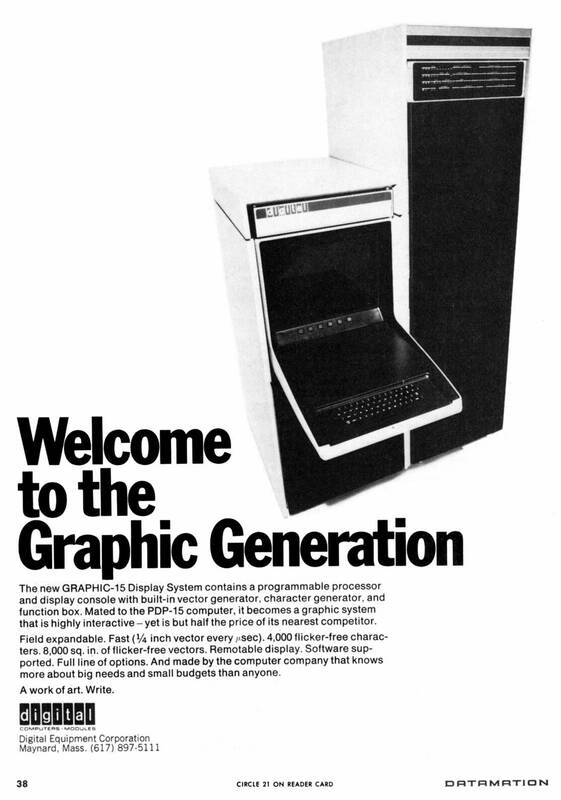 led to Ikonas Graphics Inc.
Fuchs, H., and Poulton, J., "PIXEL-PLANES A VLSI-Oriented Design for a Raster Graphics Engine," VLSI Design (formerly Lambda - The Magazine of VLSI Design), Third quarter, 1981, pp 20-28. Fuchs, H., Poulton, J., Paeth, A., and Bell, A., "Developing Pixel-planes, a Smart Memory-Based Raster Graphics System," Proceedings of Conference on Advanced Research in VLSI, January 25-27, 1982, pp 137-146. 1977 SIGGRAPH Exhibitors List - I need more years. Founded 1957? by Tom Hagen, Luis Schaefer, Richard Nixon ?? 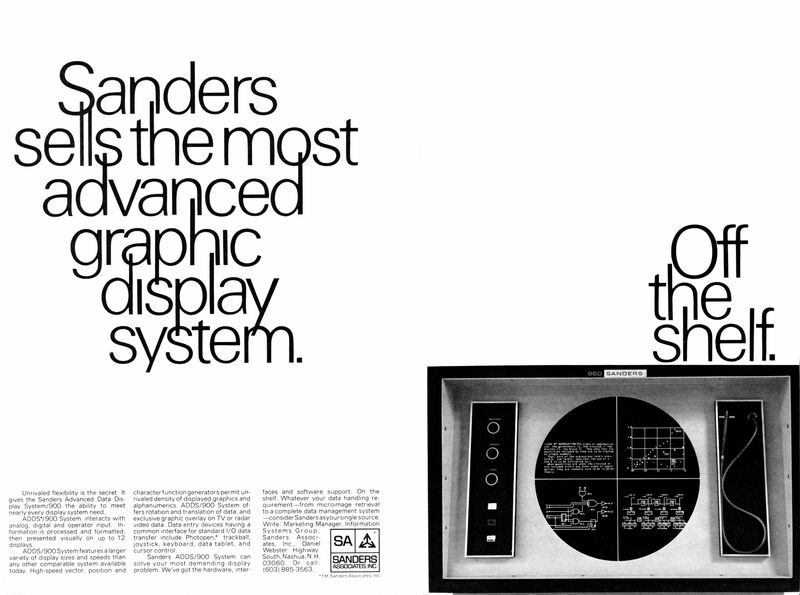 Advertisements and Data Sheets - search for "Adage"
1974 - Frame Buffer - J. Kajiya, I. Sutherland, E. Cheadle, A Random-Access Video Frame Buffer, Proc. Conference on Computer Graphics, Pattern Recognition and Data Structure, 1975.
founded by John Metzler - spinoff from Data Disc? 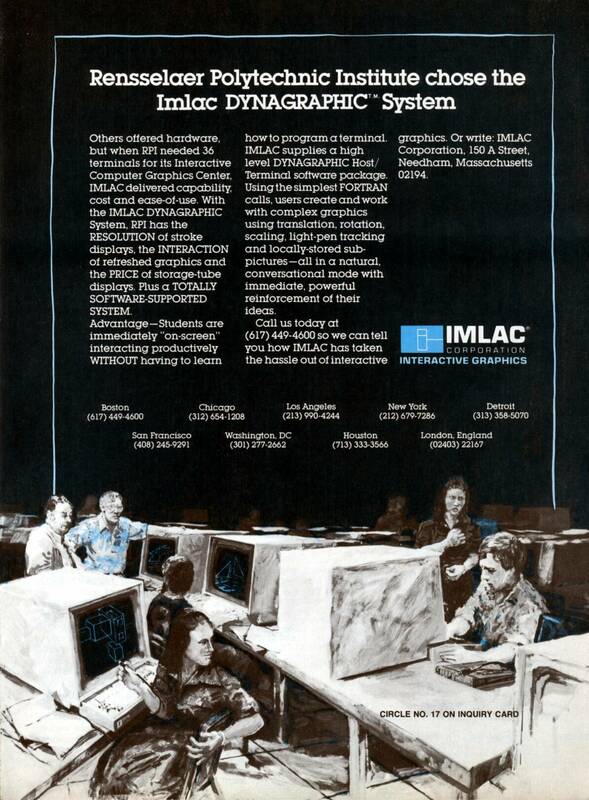 acquired by Gulton Industries in 1983, later sold to 3M Corp.
1960s - vector display system - IDIIOM (IDI Input-Output Machine). 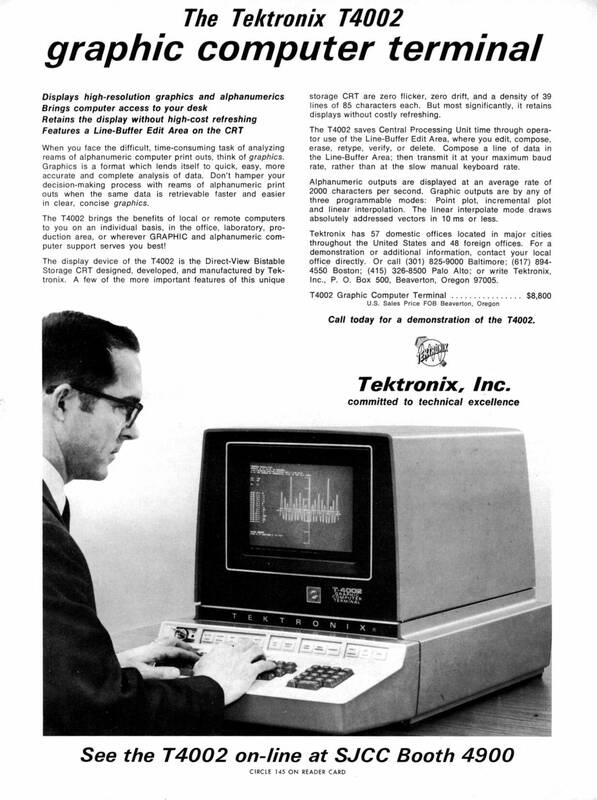 1976 - Model 70 Image Computer can provide up to 12 512 x 512 x 8 images. A hardware split screen feature allows an arbitrary window on a 2048 x 1536 (x 8 bit) virtual memory. 8 graphic overlay planes are provided. Only the overlay planes are color-mapped; the 8-bit in, 16-bit out Color Assignment Function Memory provides 5 output bits for each color channel, with the 16th bit selecting the mode for combining graphic data with image memory: additive or overlay (replace). The cursor is programmable, 64 x 64 pixels. 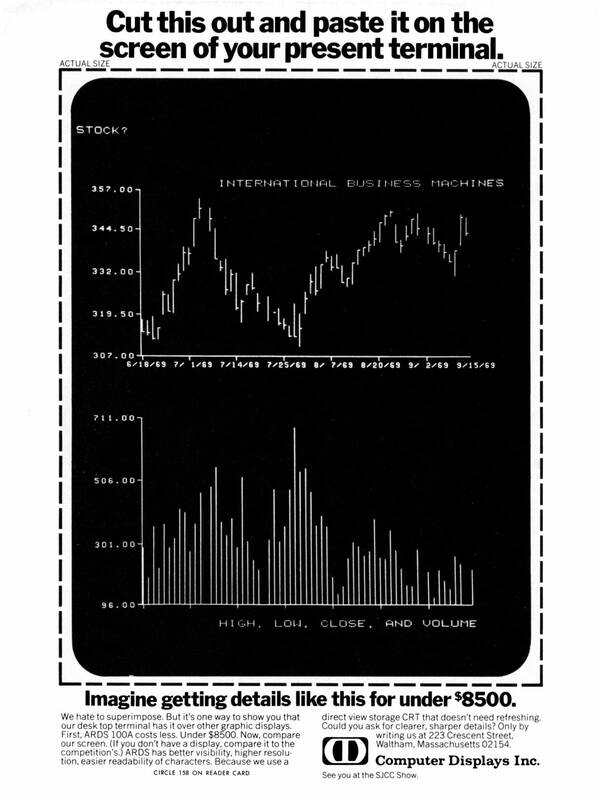 advertisements and data sheets - search for "Lexidata"
founded 1982 by Jim Clark et. al. 1971 report by Ralph Ahearn & Dave Rutland - A digital picture processing system for extracting information from photographic film records was constructed and delivered. The system uses a Digital Video Converter that permits picture data transfer and display between a Digital Processor and a standard 525 line Television System. The Digital Processor has an 8000 word core memory and a Digital Tape Unit for storage and processing of digitized pictures. The Digital Video Converter stores a complete digital picture consisting of 384 x 489 picture elements on a magnetic disc. The picture elements, each having one of 256 possible shades of grey, are refreshed at standard television rates and are displayed in black and white on a television monitor or analyzed in a color television densitometer display. Television pictures of photographic transparencies are produced from a precision camera, digitized at an 8 MHz sampling rate and recorded on the disc for subsequent analysis by the Data Processor. Software for self-checking the system, transferring picture data and digitizing pictures was supplied with the equipment. 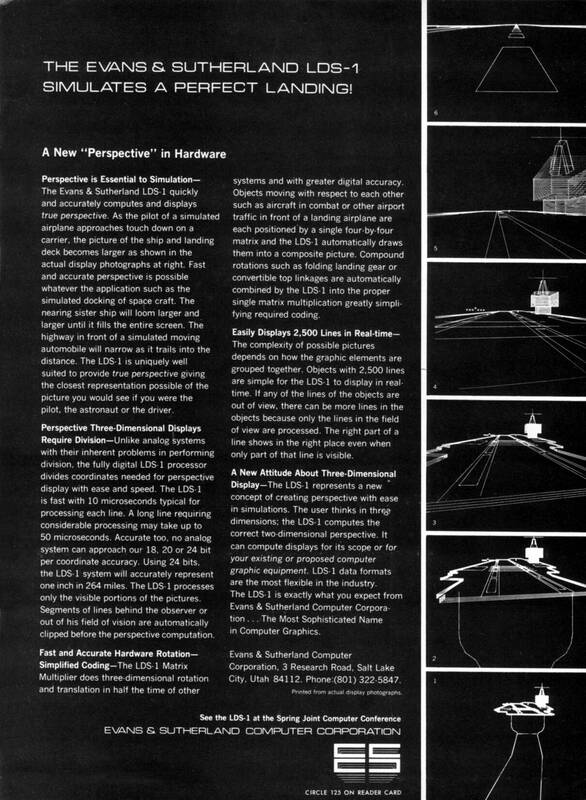 1985 Doenges, Peter K. (Evans and Sutherland), "High Performance Image Generation Systems: Overview of Computer Image Generation in Visual Simulation", Course notes for course #14 (High Performance Image Generation Systems), ACM SIGGRAPH '85, July 22, 1985. 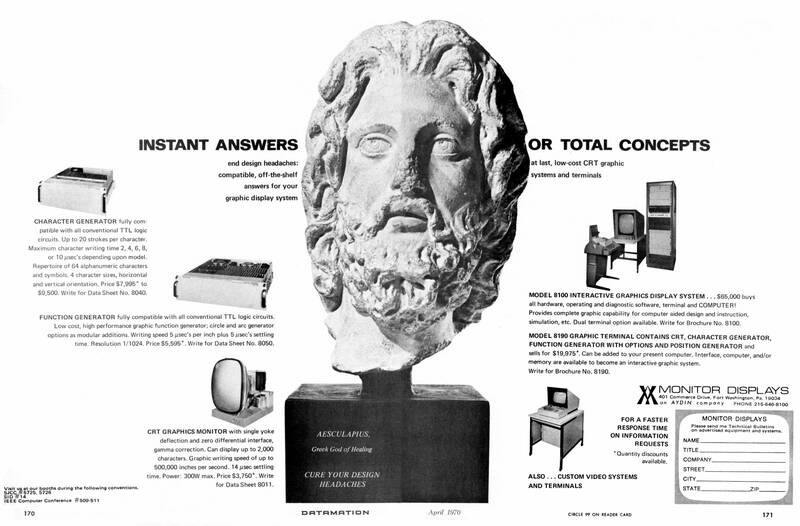 Some other computer graphics/imaging history references - in no particular order. Carl Machover "A Brief Personal History of Computer Graphics"
W. Myers, "Staking Out the Graphics Display Pipeline," in IEEE Computer Graphics and Applications, vol. 4, no. 7, pp. 60-65, July 1984. Many cardboard boxes of stuff I have in storage!